GAS has a few publications for sale which can be bought online by contacting us at gas_story@hotmail.com and paying by Paypal. This booklet was written by GAS Chair Pauline Cordiner and beautifully illustrated by GAS storyteller Jacqui MacLennan for our “Aberdeen Storytelling Festival” in 2017. It’s targeted at bairns from pre-school age (with adult assistance) to early secondary and includes stories, a template for a story card game and “Create Your Own Story” in which children are encouraged to make up their own structured tale with heroes, baddies, struggles, landscapes and hopefully a Happily Ever After (or not depending on how the budding storytellers feel!) There are also illustrations to colour in and a section to encourage inter-generational storytelling – i.e. spaces to encourage young storytellers to ask their own family members for their own stories. The booklets cost £4.50 plus postage. For a long time, GAS members had talked about recording a CD of their favourite stories. A Community Action Grant from Shell UK Ltd enabled this to happen in 2007. The cd is a collection of nine favourite stories from the team, including ‘The Tinder Box’, ‘How the Buttery Came to Be’, ‘Anansi and the Hole to China,’ and GAS’s honorary President, Stanley Robertson, the master storyteller, with a special tale with a very timely warning – The Moose Trap. The stories are all suitable for children – and of course adults too! At the beginning of 2003, GAS was awarded nearly £14,000 from the Local Heritage Initiative Scotland to carry out an oral history project in the Mearns, part of South Aberdeenshire. A steering committee was set up comprising GAS members at the beginning, though it has been added to by some folk who heard about the project and wanted to be part of it. Early research involved trawling the area looking for existing groups who might be willing to tell their stories or the stories of their communities and In June 2003, a co-ordinator was appointed to make contact with as many of these groups as possible and to begin to identify those who were willing to have a follow up chat. 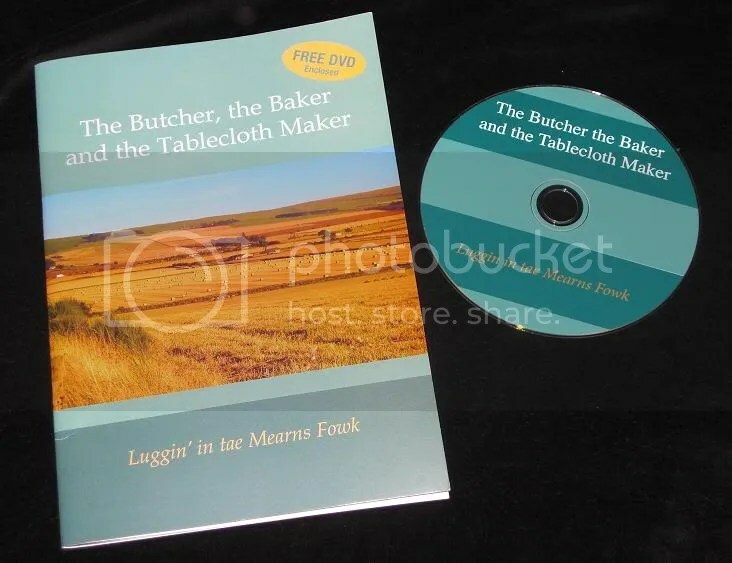 On November 25, 2005, the DVD – which represents the culmination of the Persephone Project was launched at the Howe Festival in Laurencekirk, a fitting venue for ‘The Butcher, the Baker and the Tablecloth Maker,’ a cultural & oral history of the Mearns. Some copies are still available, so please email us to order a copy.